Last Thursday I had great fun attending a Beginners Weaving Workshop. It was hosted by the wonderful Stephanie at Le Petit Moose. I had previously seen (stalked!) Stephanie's beautiful work on Instagram, so when Barbara at Rocking Stitch announced Le Petit Moose had planned some workshops in her studio I jumped at the chance to join. We were taught the basics of weaving on a loom, as well as setting it up and finishing off your project. 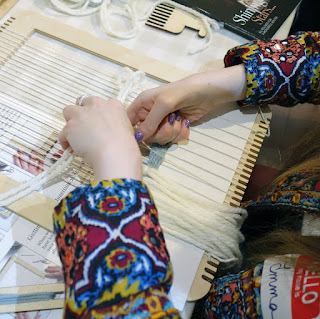 As part of event we were actually given our own laser cut loom to take away so we could continue on our weaving journey. I cannot thank Stephanie enough for her patience in teaching us, particularly with me! I struggled with getting my pattern to go into a shape, so it's something I look forward to practicing. As you see I didn't get very far in my weaving. I blame my inability to chose a colour!